Bring joy to her heart this Christmas with this adorable teeny tiny sterling silver heart. She will love it, especially when she sees her very own initial engraved on the front! Customize with your option of font style in traditional uppercase or trending lowercase, professionally engraved by our own in-house engravers. A perfect fit with room to grow, this extendable silver chain has three adjustable lengths of 13", 14" and 15". 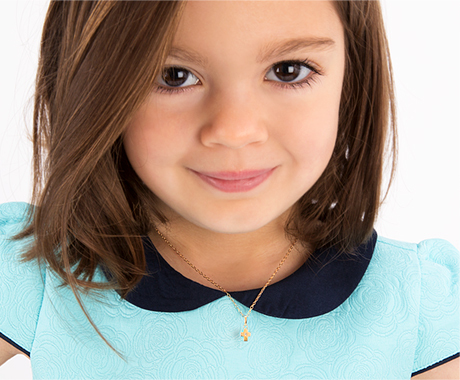 An amazing deal for your amazing little girl! I ordered this for my grand daughter’s first Christmas and I can hardly wait. I know it will look adorable on her. It arrived early even after a questionable address issue. I truly appreciate Tiny Blessings care in contacting me when address was flagged and checking with me before sending the piece out. True customer service. Five star service, five star jewelry.